After recruitment and soldier welfare, the major concern of the Australian Parliament during World War I was the defence of Australia. 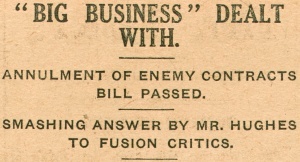 A series of Acts, aimed at protecting Australia, were passed by the Parliament. These Acts impacted on the economic, social and political life of Australia. Businesses were barred from trading with the enemy, hotel bars were closed and the prices of everyday food items were fixed by law. 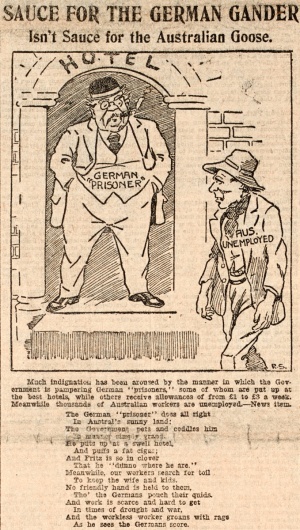 Opponents of the war also had their mail censored or were watched by the new intelligence services, 'enemy aliens' were interned and the leaders of the Industrial Workers of the World union were deported without trial. These and other measures were strongly supported by the Australian Parliament and Australian people. During this time of national emergency – when the future of Australia as part of the British Empire was in doubt – the security of Australia and the defence of the Empire were vital. The opposition usually supported the government's ability to do everything it could to defend Australia. 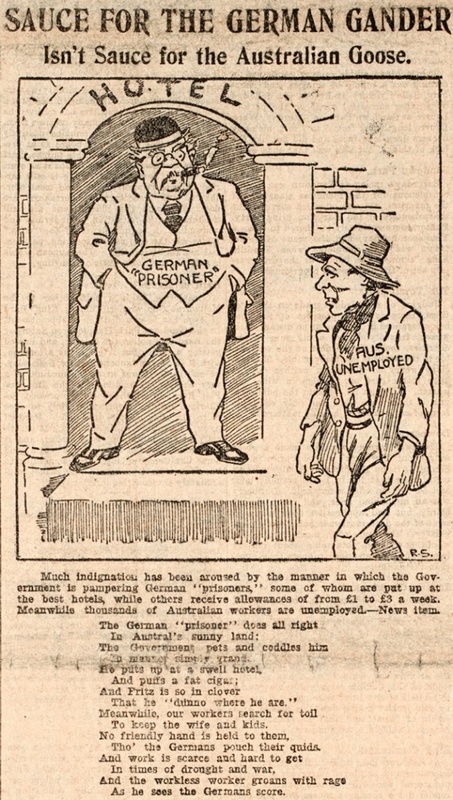 Some members of Parliament did speak out against the laws passed by the Parliament – in particular the War Precautions bills – and campaigned against the loss of Australians' civil rights. However, most members felt extreme measures were required in a time of national emergency and trusted the government to use their powers wisely. The fact that many bills were modelled on British laws was reassuring. Several senators and members of the House of Representatives joined the fight overseas while remaining elected representatives of the Australian Parliament. Many former and future members also served. In fact in the 1946-49 Parliament approximately one-third of members were World War I veterans. Note: Andrew Fisher resigned as Prime Minister and as a member of the Australian Parliament in October 1915. The Attorney-General, William (Billy) Hughes, was then elected leader of the Labor Party of Australia (ALP) and commissioned Prime Minister. He continued as Prime Minister for the remainder of World War I, even after he left the ALP in November 1917 and formed the Nationalist Party of Australia.